VPNs are great for keeping snooping countries, Orwellian agencies and thieving criminals at bay, but they’re not always straightforward to setup and when you have a laptop, mobile phone and tablet it’s a pain to maintain the VPN on each of them. 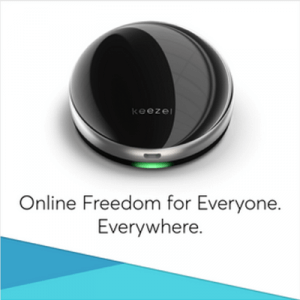 Keezel has a solution in the shape of a personal wifi hotspot which has VPN software baked into the firmware. Daniel finds out more from Aike Müller, Co-Founder and CEO. The way the Keezel works is that when out-and-about in coffee shops and other public wifi areas, you connect all your personal devices to the Keezel wirelessly. The Keezel connects to the public wifi network, establishes a VPN connection to a secure server and then all your communications travel securely across the network. Neat. The standard price is US$99 for the Keezel and then $5 per month for the VPN service. The Keezel is currently on Indigogo’s InDemand having been originally 540% funded back in August 2015. There are some special perks available with devices are expected to ship in March 2016.